As you may know, I don’t typically read dog books by choice. If I read a book with a dog on the cover, it’s usually because that book is on an award list, I’ve gotten a review copy, or a friend has guilted me into it. (Hi, Jessie!) Well, my latest read, a book with a dog front and center on the cover, is one of those that I felt I had to read, especially if I plan to promote it to my students. I picked up this book, Cynthia Lord’s A Handful of Stars, because it’s nominated for next year’s South Carolina Children’s Book Award. Before I give a short synopsis of A Handful of Stars, I will tell you that I enjoyed this book. Despite the dog on the cover, the dog in the story, in my opinion, was not the biggest part of the story. More than anything, he precipitated the events that led to the book’s central relationship. I can live with that. Lily never would have thought that her blind dog and a peanut butter sandwich could lead to a remarkable friendship, but that’s exactly what happened. When her dog, Lucky, slips his leash and rushes headlong into danger, it’s Salma Santiago’s sandwich that redirects him and saves the day. Lily and Salma grow even closer as they paint bee houses, plan to save Lucky’s eyesight, and prepare for the Downeast Blueberry Festival. The festival marks the end of the blueberry season, and one of the highlights of the event is a pageant. Lily isn’t interested in entering the pageant, but Salma is. Lily isn’t so sure about Salma’s plans to enter the pageant. After all, no migrant worker ever has. She helps her new friend, though, because that’s simply what friends do. Salma may not be one of the local girls, but she contributes just as much to their community as anyone else, and she deserves to be a part of this special event. Will Salma win the title of Downeast Blueberry Queen? Will Lily and Salma find a way to save Lucky’s eyesight? What will become of this special friendship once blueberry season ends? 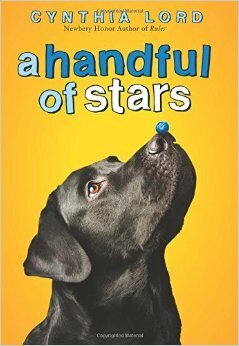 Answer these questions and many more when you read A Handful of Stars by Cynthia Lord. In my opinion, A Handful of Stars is a particularly timely book. I think it emphasizes commonalities and bonds of friendship regardless of socioeconomic or cultural backgrounds. Lily and Salma’s relationship teaches all who read this book that a friend is a friend, no matter where they’re from or what they do. Sure, there may be bumps in the road, but the most important thing is to be there for each other. I don’t know about you, but I can think of a few adults who could stand to learn this lesson. Click here for more information on this book and others by Cynthia Lord. It’s not very often that I read a book and think, “Man, I wish I’d listened to this as an audiobook.” But that’s just what happened with my latest read, See You in the Cosmos by Jack Cheng. The very nature of this book makes it a perfect story to listen to…providing you’ve got the right narrator(s). I haven’t experienced the audiobook, so I can’t speak to how well it’s done, but, like Jay Asher’s Thirteen Reasons Why, this is a book that you probably need to hear to truly appreciate. 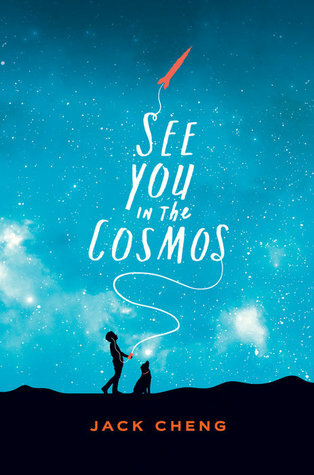 See You in the Cosmos is essentially a transcript of eleven-year-old Alex Petroski’s life. He’s recording the world around him on his Golden iPod–a tribute to the Golden Record launched by his hero, Carl Sagan–and everything that pops into his head goes into this record. But who is Alex making this recording for? Aliens, of course. Alex wants to show them what life on Earth is/was like and to provide them with the sounds of his home. Alex talks about Carl Sagan and his canine namesake, his mom and her quiet days, his absent brother, and the rocket he’s built to launch his Golden iPod into space. He talks about his solo trip to SHARF (the Southwest High-Altitude Rocket Festival) and the people he meets there. He also talks about what he’s discovered about his dad through Ancestry.com, and that’s what leads him on a journey that he never could have anticipated. From his home in Colorado to New Mexico to Nevada to California and back again, Alex meets new people, makes friends, and finds a sense of family that will help him through some tough times ahead. And even when things get difficult, Alex keeps his sense of wonder about the world around him and his hope that things will work out. His attitude is contagious and may just help to change the lives and hearts of those around him. Even without listening to this book, Alex’s voice shines through each page. He actually reminds me of one of my all-time favorite students. (Yes, all educators have favorites. Anyone who says different is lying.) My favorite student–or “My Boy,” as I like to call him–is inquisitive, funny, innocent, generous, very literal, and always wants to see the best in people…even when some of them don’t deserve it. That’s what I see in the character of Alex. He is all of those things I just mentioned, and he never holds a grudge against those who wrong him. It would have been all too easy, but, at least in my mind, Alex’s focus on the larger universe allows him to truly see the bigger picture. So what age-range would I recommend See You in the Cosmos to? Well, I think some upper elementary readers may like it, but I think this book is ideally suited for a middle grade audience, particularly readers who appreciate science. It’s a fun, sometimes light-hearted, read, but it also deals with serious stuff like abandonment, mental health, family secrets, and holding onto true friends. See You in the Cosmos isn’t like any book I’ve read in recent memory, and I’m betting anyone else who gives it a try will feel the same way. Read it, and let me know what you think. If you’ve read it as an audiobook, I’d also love to get your take on how that experience may differ from the print version. For more information on this book and others by Jack Cheng, visit the author’s website. You can also connect with him on Facebook, Twitter, and Instagram. I’ve been a fan of Elizabeth Eulberg’s novels for a while, and nothing has changed now that I’ve read her first middle grade novel, The Great Shelby Holmes. You can probably guess from the title alone why I like this book so much. 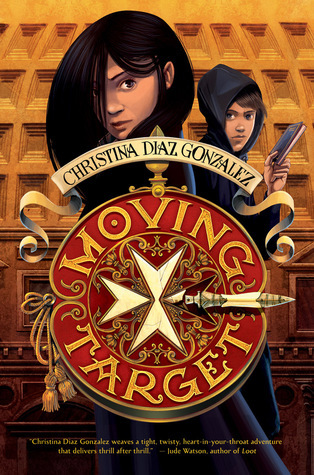 If it’s not readily apparent, I’ll clue you in–it’s essentially a kids’ version of Sherlock Holmes, and it’s outstanding. The Great Shelby Holmes takes place in present-day New York City–Harlem to be exact–and the Holmes we’ve all come to know and love is now embodied by a nine-year-old girl named Shelby. John Watson is the new kid, having just moved to 221 Baker Street from a military base with his mom. Watson, who longs to make friends in his new home, is sort of stuck with Shelby, who is probably the oddest, smartest, most infuriating girl he’s ever met. He quickly learns that Shelby is known throughout their neighborhood as a detective. Everyone seems to like and respect her–except maybe the police–but Shelby doesn’t really have any friends. Watson finds himself wanting to be Shelby’s friend, but she doesn’t exactly make it easy. She’s often insulting, bossy, and dismissive, and Watson wonders if trying so hard to connect with her is even worth it. But he keeps on because hanging around Shelby is never boring. 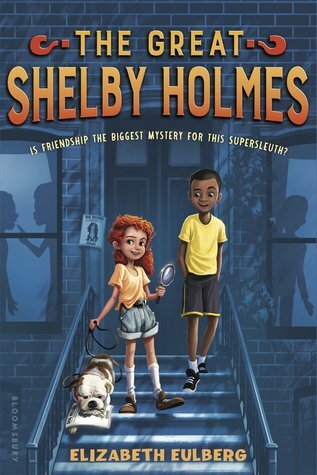 When a classmate comes to Shelby about her missing show dog, Watson joins Holmes in her investigation. As it turns out, Watson is more help than Shelby expects him to be. Together, this unlikely pair works to solve the case of the missing dog. Will solving this case and working together be easy? No. Will Holmes share everything, including clues and possible leads, with Watson? Again, no. Will they solve the mystery and become friends at the same time? Affirmative. How will everything unfold for Holmes and Watson? Well, you’ll have to figure that out for yourself. I thoroughly enjoyed The Great Shelby Holmes, and I thank my not-so-secret pal at school for giving me such a great book. I fully intend to read the further adventures of Shelby Holmes and John Watson. According to Elizabeth Eulberg’s website, we can look forward to at least two more stories from this entertaining duo. While this book is written for a middle great audience, I think it’s perfect for introducing elementary school students–3rd grade and up–to Sherlock Holmes. That being said, I do think readers familiar with the original Holmes and Watson–or even just the film or TV versions–will find this book even more enjoyable than their younger counterparts. There are nods to the other versions of the Holmes stories that fans are sure to appreciate, like an English bulldog named Sir Arthur or a pseudonym with the surname Cumberbatch. If you’d like to learn more about The Great Shelby Holmes or other books by Elizabeth Eulberg, visit the author’s website. You may also want to connect with her on Facebook, Twitter, or Instagram. It’s not exactly a secret that I have issues with dog books. (The blame goes to Old Yeller.) This is something of a problem when one is an elementary school librarian. They’re everywhere. Most of the time, I pick up a dog book because I have to read it. It could be a South Carolina Book Award nominee or a pick for my district’s Battle of the Books competition. (There are a couple of rare cases when I actually choose to read a dog book myself.) In the case of my latest read, Dash by Kirby Larson, I read this book because it was chosen for Battle of the Books this year. Last year, I read Duke by Kirby Larson, so I knew kind of what to expect with Dash. 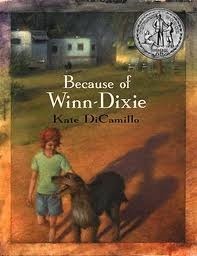 I knew that this book was another historical fiction story, it took place during the Japanese internment of World War II, and it had a dog in it. That’s about as far as my knowledge went for a while. When I made time to sit down and read this book, I quickly realized that, while the dog is an important part of the book, it’s not the primary focus. That honor goes to Mitsi Kashino, a young Japanese-American girl living on the west coast and dealing with the fallout of life after Pearl Harbor. Her story is one that is often glossed over in history books, but it is one that is extremely important for readers of all ages to know more about. Things are not easy for Japanese Americans after the attack on Pearl Harbor. Even though many of them have been in America their entire lives and love their home, people–including neighbors and friends–now view them with suspicion and even hatred. Mitsi Kashino knows that things are bad, especially when her two best friends suddenly decide that they want nothing to do with her. Now, it seems that Mitsi’s only friend in the world is her beloved dog Dash. He’s always happy to see her, and he doesn’t care about what she looks like or where her family is from. Not everyone is like Dash, though. Soon, Mitsi’s family is forced to leave their home and move to an internment camp…where pets aren’t allowed. Mitsi is heartbroken that she can’t take Dash with her, but she finds a kind neighbor who agrees to care for her dog until they can be reunited. Life at the camp is not easy, but Mitsi is eventually cheered by letters from Dash. She writes him back, telling him what the camp is like, but she keeps some things to herself. Like how her brother has started hanging out with troublemakers or how she worries that living in the camp is tearing her family apart. Eventually, Mitsi makes a new friend and finds a measure of joy, even in a horrible situation. She also thinks of a way to keep Dash with her while they’re far apart. But what will happen when Mitsi and her family are forced to move once again? Is there any hope of ever seeing Dash again? Will life ever return to normal? Read Dash to learn how a girl holds onto hope–and her dog–even when times are difficult. Dash, like I’ve mentioned previously, addresses an event that most history books gloss over. I’m ashamed to admit that I knew nothing of the internment of Japanese Americans until I was in college. It’s just not something that was talked about. Books like this one help to remedy that situation, letting young people know that the United States is nowhere near blameless when discussing atrocities committed during World War II. (Further conversations could expand on other cruelties in American history–slavery, the Trail of Tears, the current treatment of immigrants, refugees, and Muslims, just to name a few.) Yes, these are serious issues to discuss with upper elementary and middle grade students, but, given what is happening in the world right now, those discussions are especially timely. 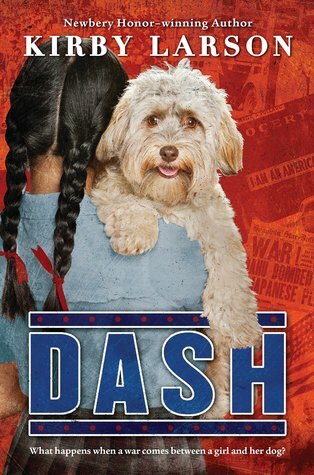 Even though Dash is a dog book, the story itself is one that will stay with me. I actually wanted the book to last a bit longer, giving me a glimpse of Mitsi’s future. Dash is a great book, and I know my students will thoroughly enjoy it. My primary hope is that it will make them think. For those who enjoy reading Duke and Dash, Kirby Larson has another dog book that was recently released. The book is Liberty, and, like its predecessors, it’s a work of historical fiction set during World War II. From what I’ve gathered from Goodreads, it takes place in 1940s New Orleans, giving yet another look at kids–and dogs–during the war. I’m not sure when/if I’ll get around to reading Liberty, but I’m fairly confident that it will be popular with my students. If you’d like more information on Duke, Dash, Liberty, and other books by Kirby Larson, check out the author’s website, Facebook page, or Twitter feed. I’m usually not one to go for books with dogs on the covers (as I believe I’ve mentioned here before). I threw that out the window, though, when NetGalley gave me the chance to read an early copy of Wish by Barbara O’Connor. I was first introduced to this author’s work when I became an elementary librarian back in 2010. Since then, I’ve come to rely on O’Connor to provide both me and my students with heart-warming, relatable characters and charming, well-written stories. Wish, which will be released on August 30th, delivers on all counts. In Wish, readers are introduced to eleven-year-old Charlie Reese. Charlie believes in the power of wishes. She’s been making the same wish for a long time, and she’s convinced that it will come true one of these days. She is ever hopeful. Due to several issues with her parents, Charlie has been uprooted from her home in Raleigh and sent to live with her Aunt Bertha and Uncle Gus–people she’s never met–in the Blue Ridge Mountains. Charlie is not happy about this situation, and she makes her displeasure known to nearly everyone. She can’t wait to leave these hillbilly kids behind and get back to where she belongs. Well, not everyone takes Charlie’s attitude at face-value. Aunt Bertha and Uncle Gus are thrilled to have Charlie in their home. They treat Charlie like their own child and do whatever they can to make her feel welcome. There’s also Howard, a young boy who never lets anything bother him. He’s assigned to be Charlie’s Backpack Buddy on her first day in a new school, but he takes it few steps further and tries to become Charlie’s friend. Charlie doesn’t quite know what to make of these people being so nice to her, and she lashes out at them quite a bit. She eventually comes to realize, though, that they’ll still be there no matter how mean she is to them. Maybe this place and the people here aren’t so bad after all. As Charlie begins to adapt to her new surroundings, she also crosses paths with a stray dog. Charlie feels a kinship with this dog–who she names Wishbone–and she’s determined to give him a great home. Charlie knows that Wishbone longs for a family and a place to belong just like she does. Days and weeks pass, and Charlie grows more and more comfortable with her new life with Bertha, Gus, Howard, and Wishbone. What will happen, though, when it comes time for her to return to Raleigh? Will she have to leave behind the family and friends she’s found in the mountains? Is returning home to her parents really what’s best for her now? Charlie doesn’t know which way to turn, but maybe all that wishing she’s done–with an assist from those who really love her–will help everything to turn out for the best. 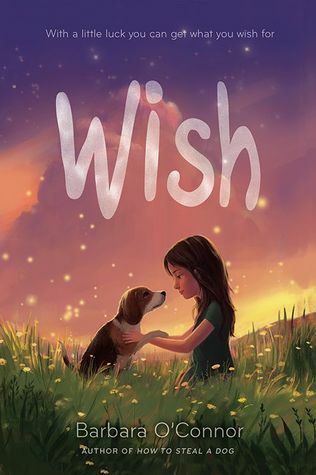 Find out how one girl’s special wish comes true–but maybe not in the way she expected–when you read Wish by Barbara O’Connor. I cannot say enough good things about this book. I laughed, I cried, and I reflected on my own childhood. Like Charlie, I spent my summers weeding the garden, picking vegetables, and going to Vacation Bible School. Those are experiences my students continue to have. Then there’s the food. Aunt Bertha’s cooking in Wish makes me think of my mom’s cooking. Fried green tomatoes, cobbler, potato salad, biscuits, etc. I’m getting hungry just thinking about it. (Seriously, there’s nothing like good ol’ Southern food.) I’m betting many readers will feel the same way. Aside from summer life and food, Wish also addresses things like friendships (with both humans and canines), dealing with anger, and what home and family really mean. Charlie has to come to terms with all of these things, and she does so in her own special way. Those around Charlie help her to see that things may not always turn out like she expects, but that doesn’t mean that her life is lacking in any way. With friends and family who love her, she gets everything she ever wished for. I can hardly wait to share this wonderful book with my students and teachers (which I guess is good since I go back to school tomorrow). I’m now even more excited that Barbara O’Connor is visiting my school in October, and I hope my excitement is shared by everyone in my school. I plan to buy a copy of Wish for all of my 3rd-5th grade teachers so that we can all share the love prior to this special visit. I’m confident that everyone who reads it will adore Wish as much as I do. To learn more about Wish and other books by Barbara O’Connor, visit the author’s website. Last night, I finished one more of the 2016-17 South Carolina Children’s Book Award nominees, A Million Ways Home by Dianna Dorisi Winget. Those who know me can take one look at the book’s cover and figure out why I was a little hesitant to read this one. That’s right. There’s a dog on the cover. Well, I read the book anyway, and I have to admit that I’m glad I did. Though the dog plays a part in things, he’s not the major focus of the book. That honor goes to Poppy, a girl dealing with much more than any kid should be expected to handle. 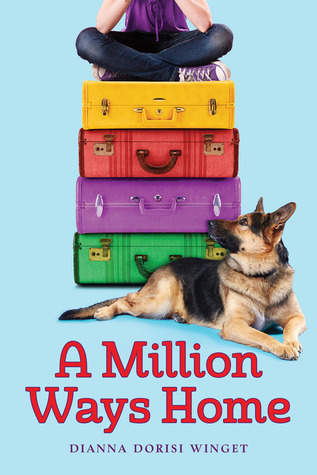 A Million Ways Home is a quick, moving, and entertaining read that is sure to appeal to upper elementary and middle grade readers. Readers will empathize with Poppy and wonder what they would do if placed in similar situations. If I had one complaint about the book, it would be that it is too “busy.” There’s already a lot going on in this book–Poppy’s reluctance to go back to the children’s center, her encounter with a criminal, Grandma Beth’s illness, Gunner’s fate, Lizzie’s problems, etc. Adding revelations about Poppy’s parents, Trey’s regrets, and even Lizzie’s issues with her dad, in my opinion, muddy the waters a bit and make the narrative confusing at times. I understand why the author included these details, but I didn’t feel like they contributed a great deal to the story as a whole. Just my two cents. For more information on A Million Ways Home and other books by Dianna Dorisi Winget, visit the author’s website.